Looking almost impossibly narrow and confined, this is the junction between Pepper Street and the area where Lower Street became Wheelock Street. It's very early in the 1970s - quite possibly 1970 or 1971. In fact it's rather difficult to say which particular street Pepper Street is joining here - Wheelock Street is to the right, and Lower Street to the left. Perhaps it might be more apt to say that this is where Pepper Street meets The Bull Ring. 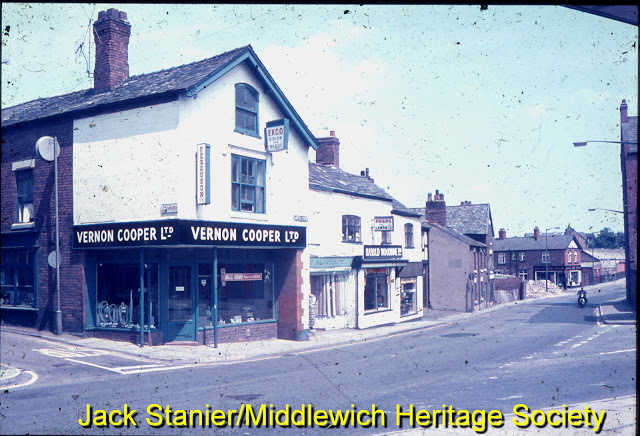 Across the road is the then brand new building built by the Co-operative Wholesale Society Ltd and known as the Co-operative Superstore, reflecting its purpose as a place where all the previously scattered Co-op departments in Middlewich were, for the first time, gathered together under one roof. It's rather disconcerting to note that the shop's entrance wasn't always on the left hand side, as it is now that Tesco Express rules the roost there. The right hand part of the building, occupied for many years by Pineland Ltd, was at this time the Co-op's chemists department. 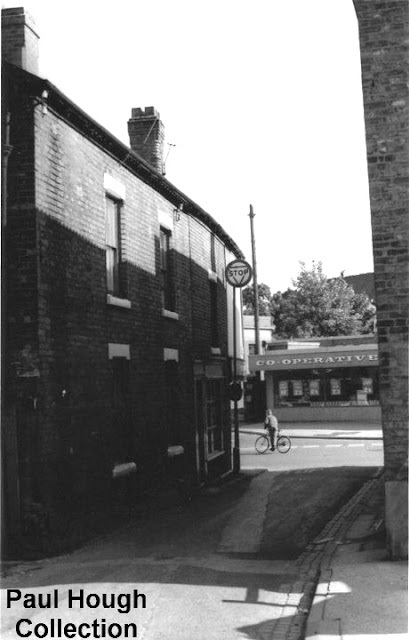 The windows in the building on the left belong to the flat above Vernon Coopers' Radio, TV and electrical shop, and the brick wall on the right was part of the house next to Dewhurst's butchers shop. as it appeared from a camera position looking in the opposite direction from just underneath the Co-op's long vanished canopy. As Seddon's Salt Works was in Pepper Street it might be thought that this cramped and inconvenient junction might cause problems for vehicles wanting to reach the works but, in actual fact, the entrance and exit for carts (and later lorries) taking loads of salt from Seddon's was further down Lower Street, next to the gas showroom near Town Bridge.